No no no, it was almost like a giant volcano that was gonna explode any moment. Let's stay on the healthy route for at least 3 days? Ingredients (3 to 4 plates)? Afterwards, drain the water and cut into small pieces, set aside. Cook the brown rice according to package instruction. I usually use more water when cooking brown rice since it tends to be dryer than regular white rice. I actually used a type of Japanese "soup base,"
It's similar to soy sauce, but infused with the flavors from other ingredients such as mushrooms or katsuo. That's good, no worries, once we add the rice in, all the liquid will be absorbed by the rice. It should be on the salty side because the flavor will get "diluted" once we add the rice in. When the mixture is ready, turn the heat to medium low. 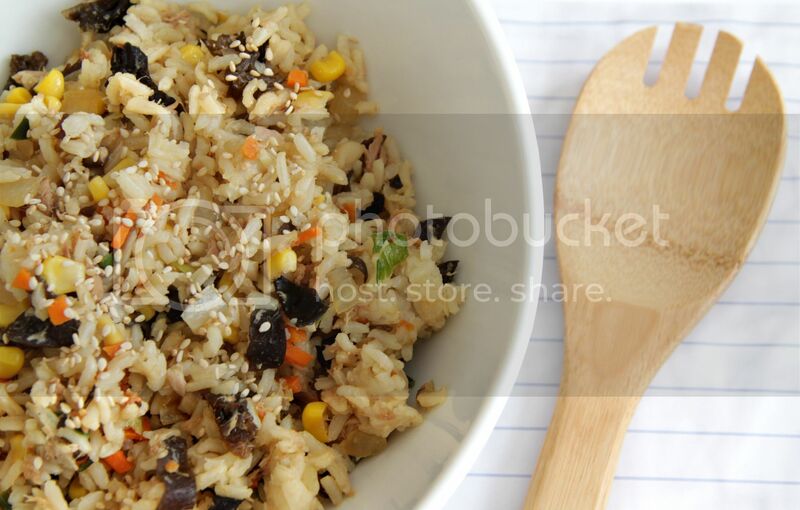 The sauce should be gradually absorbed by the rice, turning them into tiny light brown goodies. Some white pepper or sriracha sauce is also good with this dish. So many colors, so many vegetables, so healthy! This is my "detox" or "de-oil" food for at least 3 days straight! Well...guess it's time to catch up! Beautiful. We have something like this at home at least once a week. It's a great way to clean out the fridge. I love how vibrant your fried rice looks and you're the only other person that I've seen use canned tuna in their rice. I use the canned tuna in olive oil and I love it! Certainly sounds healthy! Interesting addition with the wood ear, I haven't done that before. Yeah so true, I always make fried rice when I need to clean up my fridge! I love canned tuna in olive oil more than the ones in water. Somehow the texture (oil)is more tender than the water ones! I was searching for a seasoning in the kitchen then I found the wood ear that I brought from Taiwan (better tasting than the ones I can get from CA). That's how I figured why not put some wood ear in my fried rice! Yeah so healthy, but at this moment I'm craving for meat again. I want steakkkkk!! Wooaw. Fried rice is one of my favorite at home fast foods. Quick and easy and could be made by using leftovers. I love fried rice, I still haven't decided what to eat today for dinner and fried rice sounds quite nice. Yeah I love it too, just chop everything into little pieces, toss into the pot, moments after a yummy easy meal is done!